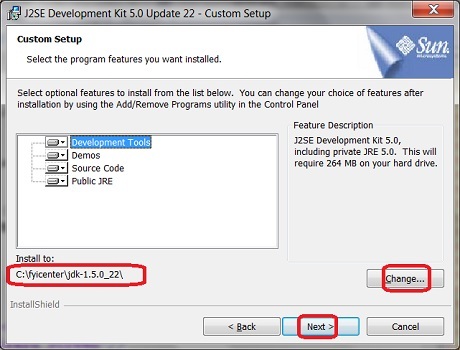 How to download and install JDK (Java Development Kit) 5? 2. Click "Java SE 5" linke. You see the "Java SE 5 Archive Downloads" page. 3. Accept the license agreement and click "jdk-1_5_0_22-windows-i586-p.exe" in the Windows Offline Installation line. 5. Save the download file to C:\fyicenter\jdk-1_5_0_22-windows-i586-p.exe. 6. Double-click on C:\fyicenter\jdk-1_5_0_22-windows-i586-p.exe to start the installation. You see the JDK 5 installation wizard screen. 7. Change the "Install to" directory to C:\fyicenter\jdk-1.5.0_22\. Download and installation of JDK 5 is done.